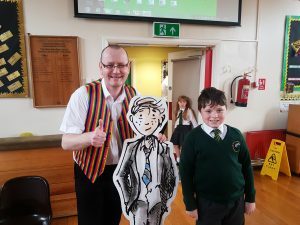 A busy term ended with two author assemblies. 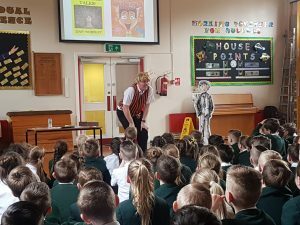 It was a joy to share Danger Zone with the pupils at both schools. They got to see the manuscripts from the different stages of the writing process and Martin’s beautiful illustrations. 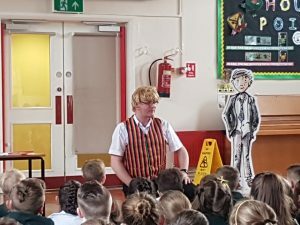 It would have been rude not to take along the storytelling waistcoat to perform one of the Tales – a crime-fighting wig featured and can be seen on the photos below. 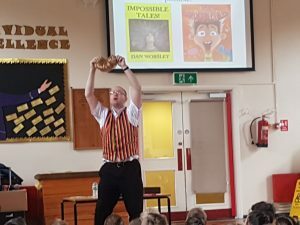 Thanks to Mrs Mather and Mrs Satterthwaite for inviting me back to their schools and promoting the accompanying book signings. 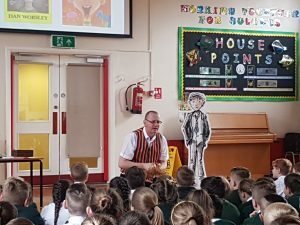 I had a great time and hopefully I’ll get to return again in the future to share the next part of my adventure with the fabulous pupils.